I am the Ceo/Artist of my own business D-Ferg Ink Productions. My studio and creative gallery is my place of business. Besides my business of design and printing, I use the gallery in many creative ways. I promote local artists with art and music shows, as well as provide art classes and private parties. 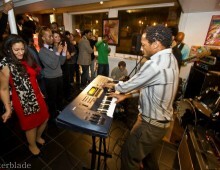 I also rent the space to other creative people from visual artists and photographers, to musicians and video shooters.